A Jet Blue Airways Airbus 320-232, registration number N535JB, powered by two International Aero Engines (IAE) V2527 turbofan engines, experienced a left engine fan cowl separation during takeoff from Newark Liberty International airport (EWR), New Jersey. The flightcrew was unaware of the fan cowl separation until passengers pointed out the loss of both halves of the left engine fan cowl assembly. The flightcrew informed the control tower of the event and returned to EWR for an uneventful landing. After parking and deplaning the passengers, the flightcrew noted additional damage to the left engine pylon, leading edge flaps, left main landing gear, and horizontal stabilator. The separated fan cowls were recovered from the airport property by the EWR airport authority and were examined for evidence of failure with the latching mechanisms, the hinges, or structure by the Safety Board. There were no injuries to the 6 flightcrew or 134 passengers. Examination of the engine fan cowls revealed that the cowl latch assemblies and their respective keeper housing assemblies were intact, showed no evidence of malfunction, and exhibited no distortion or damage. The fan cowlings structure revealed no evidence of failure. fan cowls. 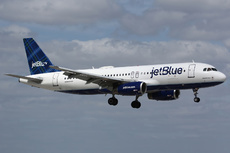 According to the Jet Blue maintenance records, the left engine maintenance signoff sheet revealed that a mechanic had latched and locked the fan cowls and this task had been verify by another mechanic. Both the ‘action’ (performance of the properly closing and locking of the fan cowls) and ‘inspection’ (verification of properly closing and locking of the fan cowls) signature blocks on the left engine maintenance sign-off sheet for the fan cowl latch procedure had been signed off as part of the Jet Blue Required Inspection Item (RII) procedures. The Jet Blue RII program requires that for safety of flight items, such as fan cowling latching, that a second mechanic or inspector who had not performed the initial task, must review and inspect the work and sign-off that the work had been performed correctly. In the case of the fan cowling latch task, the RII procedure requires that the second mechanic or inspector visually inspect the latches to verify that they are in the locked position. The National Transportation Safety Board determines the probable cause(s) of this incident to be: The separation of both halves of the left engine fan cowl assembly due to improper latching and locking of the all the fan cowl latches. The cause of the improper latching and locking of the fan cowls was due to the failure of the mechanic to unstow and properly latch and lock the fan cowl latches after the engine maintenance had been completed, and the failure of the maintenance inspector to detect and identify the unlatched condition. Contributing the incident is the design of the fan cowl latch assembly that can provide a false latch condition when the latch is neither latched or locked. Also contributing incident is the lack of adequate Airbus and Jet Blue fan cowl latch inspection guidance to detect and identify an unlatched condition.